Toyota first introduced the RAV4 in America over 20 years ago and pioneered what became known as the compact sport utility vehicle (SUV) category. Now, the brand-new, fifth-generation RAV4 has been totally reimagined and continues to blaze a trail in automotive innovation, combining sportiness and utility, and revolutionary safety technology. Its name remained the same, but this crossover SUV delivers more capability and power than any other previous versions, so you can really push the limits of outdoor exploring. If you are ready to venture out past those ordinary concrete roads in Dover NH and live life to the fullest, Bill Dube Toyota carries the most fitting RAV4 model for your future excursions. RAV4, yet again, brings a different perspective to the compact crossover realm. 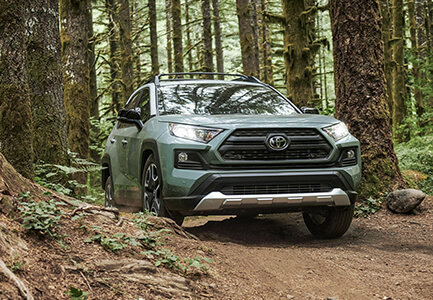 Sporting an inimitable spirit and lots of personality, the latest Toyota RAV4 built with a longer, wider wheelbase perfectly balances the blend of an aggressive off-road stance and sophisticated appeal. Flared fenders, sharp creases, and model-specific wheels emphasize outer toughness as dual chrome exhaust tips, fresh LED taillights, and a rear spoiler round out the distinctive design. For a touch of individuality, choose from nine vivid shades, like Ruby Flare Pearl, Blue Flame, and Blizzard Pearl, or the rugged, sporty Adventure trim comes in unique two-toned colors with an Ice Edge roof (rails already included) that creates an eye-catching contrast. No matter which stylish RAV4 you decide to buy or lease from Bill Dube Toyota, it will certainly draw attention (and second glances) on your drives throughout Dover and beyond. Extending the boundaries of where you can travel requires a robust motor and flexible performance. Underneath the hood of RAV4’s entrancing exterior is a Dynamic Force 2.5-liter inline four-cylinder engine that generates 203 horsepower (hp) and 184 pound-feet (lb.-ft.) of torque, while an eight-speed Direct Shift electronically controlled automatic transmission allows for seamless shifting, even at highway speeds. The Toyota New Global Architecture (TNGA) platform implements an extended wheelbase to enhance responsiveness and a sturdier core for smooth riding. You also receive a broader view of the road and naturally roomy inside. Additionally, optional Dynamic Torque Vectoring All-Wheel-Drive (TV-AWD) sends a limit of 50 percent power to the back and redistributes force as needed to improve handling and steadiness. Rear Driveline Disconnect will turn off this action according to the current type of terrain for better fuel efficiency. The ability to select Sport Mode (quicker acceleration), Eco Mode (limiting gas consumption), or Normal Mode (a mix of both) helps boost driving dynamics on any surface, as well, and lets you set your preferred operating method. 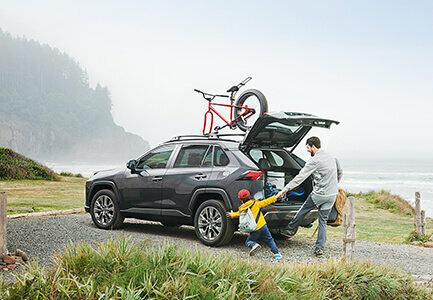 When your next trip involves the great outdoors, carrying lots of gear, and transporting heavy equipment, the newest RAV4 has the muscle and supplemental components you need. Tow 1,500 pounds (lbs.) max or opt for the Adventure grade to raise that top amount to 3,500 lbs. 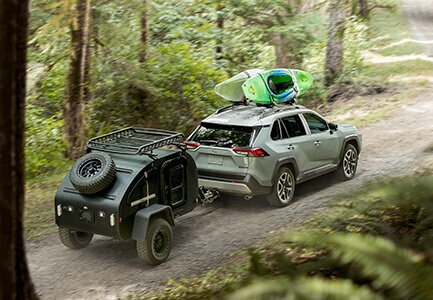 Taking whatever distant pathways you desire without difficulty is easily manageable by RAV4’s ground clearance that expands your vision of the surroundings and on AWD gas variants, standard Multi-terrain Select fine-tunes traction (detects slippage and adjusts wheelspin) through the three modes of Mud and Sand, Rock and Dirt, and Snow. Furthermore, a multi-link rear suspension utilizes the SUV’s built-in rigidity to hold a steady grip and prevent bumpy rides, so you can make the most of your adventurous outings near Dover NH. 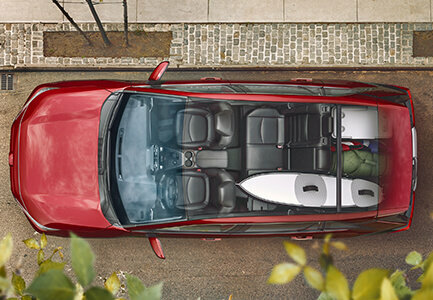 On top of these fantastic additions, every RAV4 contains 37.6 cubic-feet (cu.-ft.) of cargo space for whatever you want to pack in and a 60/40 folding split-bench rear seat to create extra room if you are hauling large loads. Make loading less of a hassle with the available power liftgate that automatically opens and closes at the press of a button and add on the hands-free function (works in conjunction with Smart Key fob) to speed up the process. Once the back is full, store smaller items on a shelf positioned between the lower and upper dash. Preparing for journeys becomes so simple with an all-new RAV4 in your driveway. Running on a pinch-and-zoom, eight-inch touchscreen display, Entune 3.0 is available for the first time ever on RAV4 trim packages. This multimedia infotainment system provides connectivity in multiple ways, including Scout GPS link, Apple CarPlay compatibility, Wi-Fi Connect, Bluetooth music streaming, and advanced voice recognition. A modifiable 4.2-in. Multi-Information Display puts important data front and center. Plus, an optional Qi-compatible wireless charging pad conveniently brings your smartphone back to full capacity when you are on the go. Best of all, everything is positioned to give you ease of access. 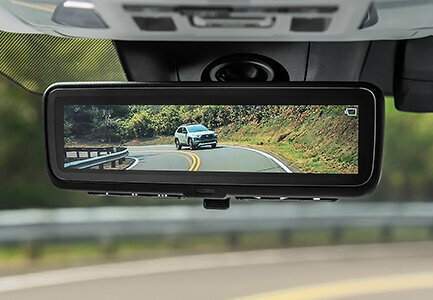 In addition, seeing behind you is much easier because of the standard backup camera or upgrade to Toyota’s inaugural digital rearview mirror using a camera attached high on the inside of the rear window. Optional features like the Bird’s Eye View Camera and Intelligent Clearance Sonar (ICS) further augment your overall safety measures for miles and miles of solid protection. The reinvented RAV4 clearly does not compromise on any aspect, from a stunning appearance and impressive versatility to comfortable seating and start-of-the-art safety. Stop by Bill Dube Toyota today to own or lease the RAV4 model that suits you the best and discover inspiration outside of Dover streets.